But still, that just didn’t seem to fit. Then I got a little more creative and decided that they needed to be filled with crème …as if they were not big enough already! With the dreary weather, and dreaming of sunny springtime days, I decided to make the crème in nice cheery spring colors to brighten the mood. I was really pleased with the results. 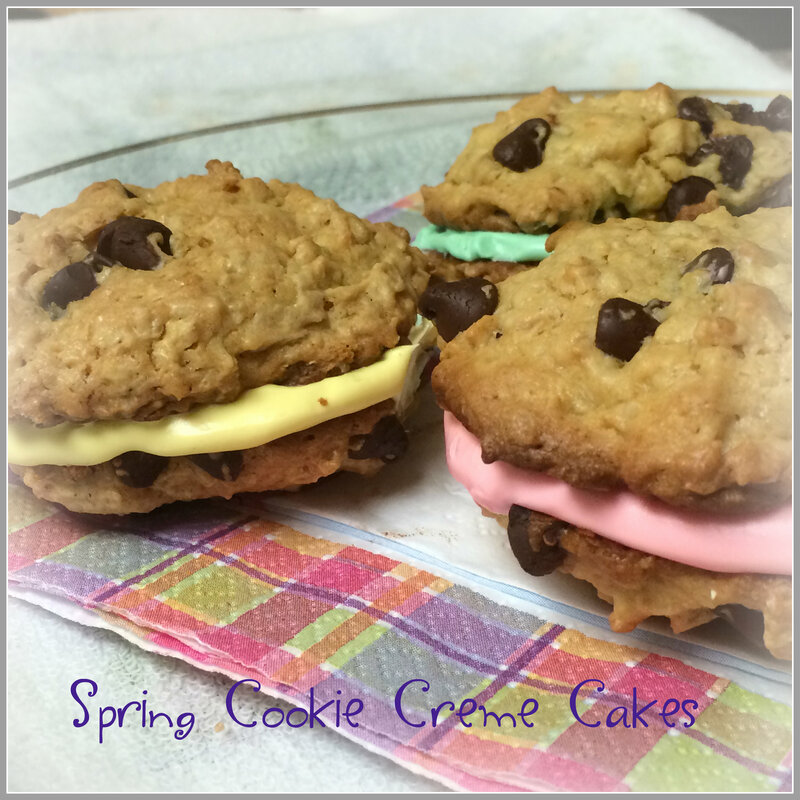 So with all that said …I decided, or rather my son decided they should be called Easter Cookie Crème Cakes, which was perfect until I realized that Easter has already passed. 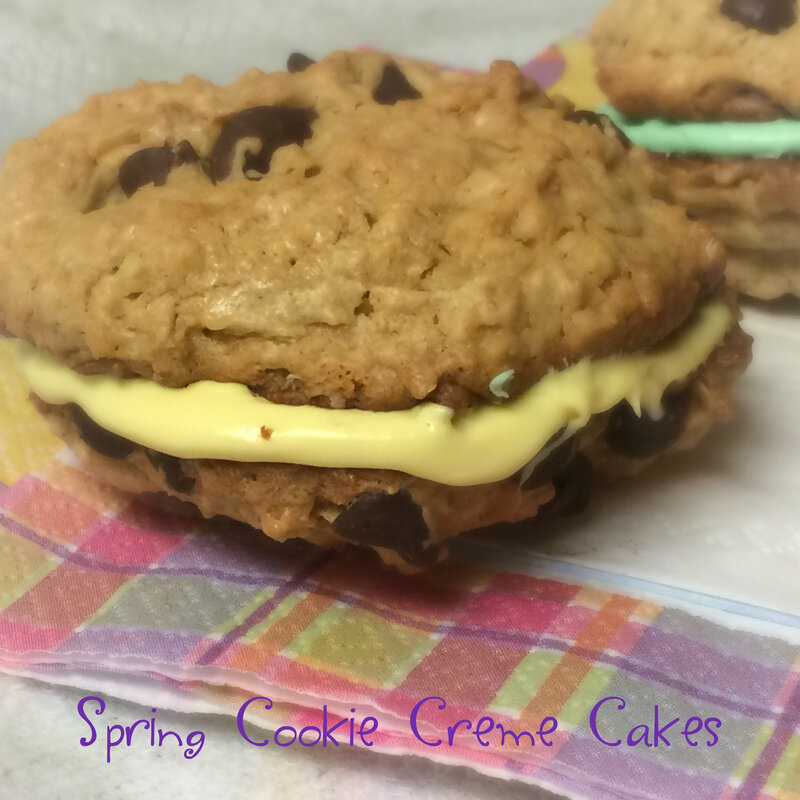 So Spring Cookie Crème Cakes it is! I believe the original recipe for monster cookies was a Betty Crocker, and then of course I modified it to fit my preferences and ingredients. My two sons loved them, they were gone by the end of the weekend. 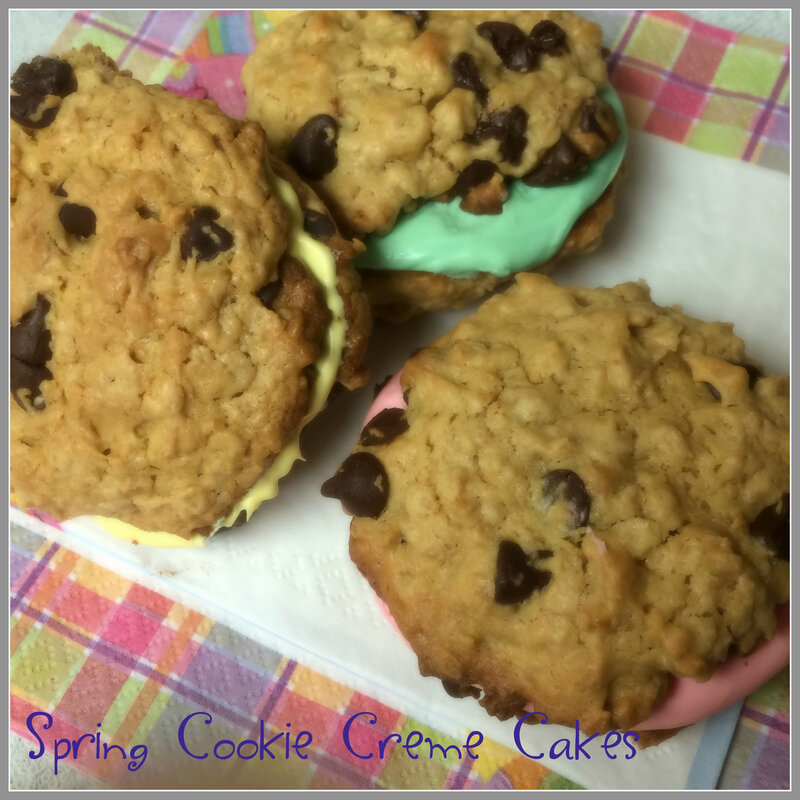 A little springtime joy on a rainy day brought to you by one little cookie …or should I say one BIG cookie? Big, chewy, flavorful cookies with a yummy crème filling. Can you eat more than one? I think I will take these over to the crowd at Fiesta Friday and see what they think. Big, chewy, flavorful cookies with a yummy crème filling. In large bowl, beat cake mix, brown sugar, butter, peanut butter, water and egg with electric mixer on medium speed until well combined. Stir in oats until combined, then stir in chocolate chips. Using large cookie scoop, drop dough 2 inches apart on ungreased cookie sheet. Bake 14 to 15 minutes or until edges are just golden brown. Cool 10 minutes on cookie sheet. Remove to cooling rack to cool completely, about 20 minutes. For the filling: With a stand or handheld mixer, beat butter for about 1 minute until creamy. Add the powdered sugar and mix on medium speed for 1-2 minutes. Pour in heavy cream and vanilla extract. Mix on high for 3-4 minutes until fluffy. Taste and add a pinch or two of salt, as needed. If filling is way too thick, add a couple more teaspoons of heavy cream. If you want spring time colors: use a drop or two of your favorite food coloring in your choice of colors. Spread a tablespoon or so of cream filling on the bottom side of half of cookies; top with remaining cookies, right side up. Cookies stay fresh and soft (with creme filling) at room temperature for 2 days in an airtight container. After that, store in the refrigerator to keep the creme center fresh. These are best eaten within 2 days, if they last that long! raining here too, understand your need for sunny cookies! Thank you so much! 🙂 Wishing you a great week! You are really back from surgery!! Cooking cleaning…I’m glad because your spring cookies look so cheerful and delicious. They would be perfect for any gathering! Still in PT but every week is stronger. Vacation in June on the beach and I am looking forward to it. Wow these are awesome Arl – the perfect thing to brighten up a rainy day! We’ve been having lovely weather here but I could still use some of these! Please help yourself Michelle 😉 We actually had a really bad storm over the weekend, lots of residence lost power for a couple of days even. Very high winds, rain and hail. Anyway, we have sunshine today! 🙂 Glad you are having lovely weather …maybe you brought it our way 🙂 Thanks so much for stopping by …I am slowly making my way around to everyone. Hope you have a great week! Thank you! They were delightfully good …but not for my waistline hehe 🙂 Thanks so much for stopping by! Thank you so much! The filling was the best 🙂 Wishing you a great week ahead! Thank you! I needed a little color in my day with all our rain here 🙂 Thanks so much for stopping by! I am slowly making my way around the party … lol even though it is already Monday 🙂 Wishing you a great week ahead!